Located in the heart of Espanola on Hwy. 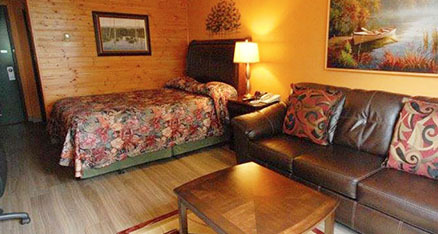 6, the Pinewood Motor Inn is a modern full-service motor inn with 51 rooms. The restaurant and lounge features a beautiful fireplace setting and offers a wide variety of foods to please the family palate and the family budget: Prime Rib is our house specialty. 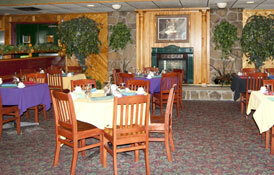 We have meeting rooms and banquet facilities for small and large groups, including weddings. For your outdoor enjoyment, we have some of the best snowmobiling and quad trails in Ontario. We are situated close to a golf course and the beach. Free high speed wireless is available in all rooms. 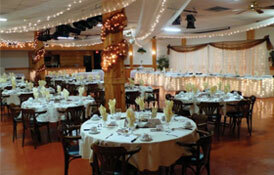 We'll pull out all the stops to make sure your special day is one to remember. In addition to our very comfortable standard rooms, we have deluxe, oversized and specialty rooms such as this one. Treat your guests to a very special and memorable evening. Relax and let the Pinewood staff take care of all.